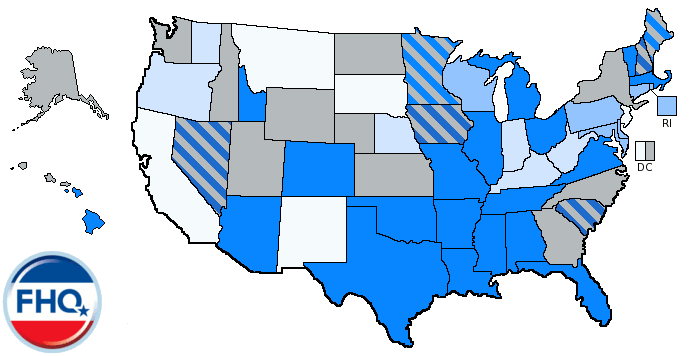 This is part three B in a series of posts this week dealing with presidential primary reform. As a refresher you can also look at FHQ's earlier synopsis of several of the various reform proposals that have been talked about and/or considered. The maps are a little clunky, but will suffice for now. I'm planning a revamping of them in the not too distant future. You can also find part one (National Primary with a Twist) here, part two (Two Birds, One Stone) here and the first installment of part three here. Let me level with you. 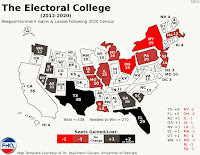 I didn't like those maps I appended to yesterday's post on the Fair and Representative Presidential Primaries Act of 2009. 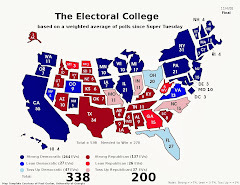 First of all, they are based on a rudimentary online map-making program that I started using when FHQ got into the electoral college analysis business. And as I said, they are a bit clunky. But as it turns out, that wasn't the only issue. I realized today that the link to the current legislation (S.1433) before the Senate (or in committee there) accidentally linked to a story on the bill's sponsor, Bill Nelson (D-FL). When I got the real link up and running I looked more closely at the outline of the legislation; specifically the region/subregion set up. What I discovered was that the subregion lottery process -- the one that had been in the example I based my maps on -- had been scrapped in favor of just setting the subregions from the outset. Well, that meant I had to change the map, which meant I had to update the map (Well, not had to so much as felt compelled to.). 1) First, the country is split into six regions. 2) Then, one or more of the states from each of those numbered regions is selected to go during one of the six contest days throughout the March to June primary season. Each region, then, is represented on each of those contest days. As is the case with other regional primary systems, this plan also has a rotation. The first subregion group (subregion A) to go in 2012, say, would go during the last week in 2016 with all the other subregional groups advancing one week earlier in the process. Instead of going first, Iowa would go during the fifth contest day of the schedule during the first iteration, for example. So, by 2028, the Hawkeye state would back in the catbird seat. [That comment has just triggered riots in Des Moines, Davenport and Iowa City. Sorry guys.] This second map shows the proposed subregions from the bill and factors in the timing component as well. The earlier a state or subregion is, the darker it is shaded. Let me close with a request. The brown gradient makes sense on the subregion map, but I debated going with the gradient you see in the regions map or just six different colors. To me, the different colors just looked too "rainbowy." However, there isn't really a trend there and that's what gradients like the frontloading maps in the left sidebar are good at depicting. That isn't the case here, though. If you have a preference for one over the other then just let me know in the comments section. UPDATE: It probably would be fair of me to include the alternative map I mentioned above as well. I mean, we do want people to make informed decisions, right? The "rainbow" look works better on the first map than a gradient. 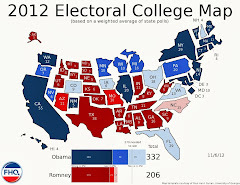 What's Wrong with 2012 Polls? On the Polling Horizon: Louisiana 2012? A 2012 Obama v. Palin Poll in North Carolina? A 2012 Minnesota Toss Up, Too? A 2012 Texas Toss Up?